The separation of powers, often imprecisely and metonymically used interchangeably with the trias politica principle, is a model for the governance of a state (or who controls the state). The model was first developed in ancient Greece. Under this model, the state is divided into branches, each with separate and independent powers and areas of responsibility so that the powers of one branch are not in conflict with the powers associated with the other branches. The typical division of branches is into a legislature, an executive, and a judiciary. It can be contrasted with the fusion of powers in a parliamentary system where the executive and legislature (and sometimes parts of the judiciary) are unified. The term tripartite system is ascribed to French Enlightenment political philosopher Baron de Montesquieu. In The Spirit of the Laws (1748), Montesquieu described the separation of political power among a legislature, an executive, and a judiciary. Montesquieu's approach was to present and defend a form of government which was not excessively centralized in all its powers to a single monarch or similar ruler. He based this model on the Constitution of the Roman Republic and the British constitutional system. 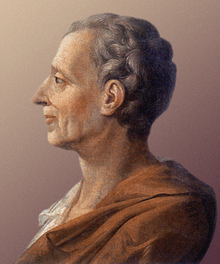 Montesquieu took the view that the Roman Republic had powers separated so that no one could usurp complete power. In the British constitutional system, Montesquieu discerned a separation of powers among the monarch, Parliament, and the courts of law. Montesquieu did actually specify that "the independence of the judiciary has to be real, and not apparent merely". "The judiciary was generally seen as the most important of powers, independent and unchecked", and also was considered dangerous. Australia does not maintain a strict separation between the legislative and executive branches of government—indeed, government ministers are required to be members of parliament—but the federal judiciary strictly guards its independence from the other two branches. However, under influence from the American constitution, the Australian constitution does define the three branches of government separately, and this has been interpreted by the judiciary to induce an implicit separation of powers. State governments have a similar level of separation of power, but this is generally on the basis of convention, rather than constitution. Police or regulators cannot initiate complaints under criminal law but can only investigate (prosecution is mostly reserved for the Crown Prosecution Service), which prevents selective enforcement—e.g., the 'fishing expedition' which is often specifically forbidden. 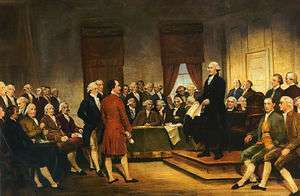 In the United States Constitution, Article 1 Section I gives Congress only those "legislative powers herein granted" and proceeds to list those permissible actions in Article I Section 8, while Section 9 lists actions that are prohibited for Congress. The vesting clause in Article II places no limits on the Executive branch, simply stating that, "The Executive Power shall be vested in a President of the United States of America." The Supreme Court holds "The judicial Power" according to Article III, and it established the implication of Judicial review in Marbury v. Madison under the Marshall court. The federal government refers to the branches as "branches of government", while some systems use "government" to describe the executive. The Executive branch has attempted to claim power arguing for separation of powers to include being the Commander in Chief of a standing army since the American Civil War, executive orders, emergency powers and security classifications since World War II, national security, signing statements, and the scope of the unitary executive. The president and vice president as well as the defunct National Assembly are constitutionally not part of the above five branches. Before being abolished in 2005, the National Assembly was a constitutional convention and electoral college for the president and vice president. Its constitutional amending powers were passed to the legislative yuan and its electoral powers were passed to the electorate. A nominated provincial governor assisted by deputees is tasked with provincial matters. It established the three supreme powers as the legislature, executive, and judicial branches, but also created two other autonomous state organs that have equivalent power, but not equivalent rank. The first is the Supreme Elections Tribunal (electoral branch) which controls elections and makes unique, unappealable decisions on their outcomes. The European Union is a supranational polity, and is neither a country nor a federation; but as the EU wields political power and is fully aware of its "democratic deficit", it attempts to comply with the principle of separation of powers. There are seven institutions of the European Union. In intergovernmental matters, most power is concentrated in the Council of the European Union—giving it the characteristics of a normal international organization. Here, all power at the EU level is in one branch. In the latter there are four main actors. The European Commission acts as an independent executive which is appointed by the Council in conjunction with the European Parliament; but the Commission also has a legislative role as the sole initiator of EU legislation. An early maxim was: "The Commission proposes and the Council disposes"; and although the EU's lawmaking procedure is now much more complicated, this simple maxim still holds some truth. As well as both executive and legislative functions, the Commission arguably exercises a third, quasi-judicial, function under Articles 101 & 102 TFEU (competition law ); although the ECJ remains the final arbiter. The European Parliament is one half of the legislative branch and is directly elected. The Council itself acts both as the second half of the legislative branch and also holds some executive functions (some of which are exercised by the related European Council in practice). The European Court of Justice acts as the independent judicial branch, interpreting EU law and treaties. The remaining institution, the European Court of Auditors, is an independent audit authority (due to the sensitive nature of fraud in the EU). The President of the Republic (Köztársasági Elnök) is elected by qualified majority of the Hungarian parliament for 5-year terms (cannot be reelected more than once). He/she has ceremonial powers only, signs laws into power and commands the military in time of peace. ↑ This latter refers specifically to the separation of powers into three branches of government: legislative, executive and judicial. ↑ Ward, Lee (2014). Modern Democracy and the Theological-Political Problem in Spinoza, Rousseau, and Jefferson. Recovering Political Philosophy. Palgrave Macmillan. pp. 25–26. ISBN 9781137475053. Retrieved 2015-11-03. Calvin's republican sympathies derived from his view of human nature as deeply flawed. Compound or mixed governments reflect the reality that human frailty justifies and necessitates institutional checks and balances to the magistrate's presumed propensity to abuse power. It was this commitment to checks and balances that became the basis of Calvin's resistance theory, according to which inferior magistrates have a duty to resist or restrain a tyrannical sovereign. ↑ Fennell, Christopher. "Plymouth Colony Legal Structure". Histarch.uiuc.edu. ↑ "Baron de Montesquieu, Charles-Louis de Secondat (Stanford Encyclopedia of Philosophy)". Plato.stanford.edu. Retrieved 2008-10-29. ↑ "lawiki.org law – Separation of Powers: the reality". lawiki.org. Retrieved 2010-09-16. ↑ Montesquieue, Charles-Louie. The Spirit of Laws. ↑ See Government accused of 'waging war' on Parliament by forcing through key law changes without debate, Independent, 19 Jan. 2016. ↑ "Constitution of the Czech Republic". Parliament of the Czech Republic. ↑ "The 1920 Constitution – 90th anniversary of the adoption of the first Czechoslovak Constitution". The Office of the Government of the Czech Republic. ↑ Duguit, Leon (1911). Traite de droit constitutionnel, vol. 1, La regle du droit: le probleme de l'Etat, Paris: de Boccard, p. 645. ↑ "Constitution du 4 octobre 1958". Retrieved 11 October 2013. ↑ "Chief Justice's Speech at Ceremonial Opening of the Legal Year 2010". Hong Kong Judiciary. Retrieved 2011-03-07. ↑ "Mature Enough for Democracy, And Sensible Too" (PDF). Global Asia. Retrieved 2011-03-06. ↑ Jain, M.P. (2010). Indian Constitutional Law. LexisNexis Butterworths Wadhwa Nagpur. p. 921. ISBN 978-81-8038-621-3. ↑ For the most recent developments see (Italian) D.Argondizzo-G.Buonomo, Spigolature intorno all’attuale bicameralismo e proposte per quello futuro, in Mondoperaio.net, aprile 2014, p. 9. ↑ "Constitution of the United States". Archives.gov. 2000-09-15. Retrieved 2013-05-05. ↑ Shelley Rigger (18 April 2002). "E-Notes: Why Taiwan's Political Paralysis PersistsFPRI". Foreign Policy Research Institute. Archived from the original on 10 February 2005. Retrieved 2008-10-29. ↑ Bomberg, Elizabeth, Peterson, John, and Richard Corbett, eds. The European Union: How Does it Work? (3rd ed) (2012, Oxford University Press). ISBN 978-0-19-957080-5 and ISBN 0-19-957080-9. ↑ Corbett, Richard; Jacobs, Francis; Shackleton, Michael (2011). The European Parliament (8th ed.). London: John Harper Publishing. ISBN 978-0-9564508-5-2. ↑ Craig, Paul; de Búrca, Gráinne (2007). EU Law, Text, Cases and Materials (4th ed.). Oxford: Oxford University Press. ISBN 978-0-19-927389-8.